Habit: Perennial herb from rhizome, glabrous or hairy. Stem: erect, branched or not. 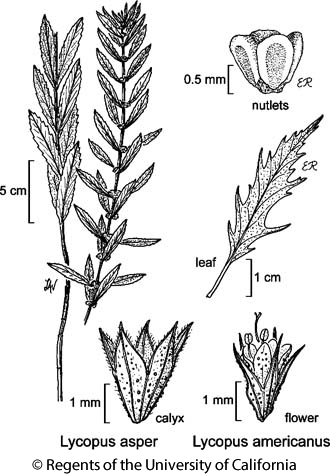 Leaf: short-petioled to sessile; blade generally ovate to lanceolate, margin toothed to deeply lobed or cut. Inflorescence: head-like in leaf axils. Flower: calyx generally 5-lobed, lobes +- equal, obtuse to short-awned; corolla +- bilateral, not 2-lipped, generally 4-lobed, lobes +- unequal; stamens 2, exserted, staminodes 2, minute, club-shaped; style exserted. Fruit: nutlets +- compressed, truncate to rounded, edges corky-thickened. Habit: Rhizomes +- slender, not thickened at tip. Stem: erect, 2--8 dm, generally glabrous; nodes short-hairy. Leaf: generally short-petioled, 2--8(10) cm; blade oblong to lanceolate, deeply lobed to cut especially in lower 1/2, glabrous to puberulent on veins. Flower: calyx lobes awl-like, short-awned; corolla 2--3 mm, +- = calyx, white. Fruit: nutlet 1--1.5 mm, tip rounded, smooth. Chromosomes: 2n=22. Citation for this treatment: John M. Miller & Dieter H. Wilken 2012, Lycopus americanus, in Jepson Flora Project (eds.) Jepson eFlora, http://ucjeps.berkeley.edu/eflora/eflora_display.php?tid=32313, accessed on April 21, 2019.